Norwegian army gathered up a combined arms brigade, which was then reinforced by United States Marine Corps and British Royal Marines. The combined brigade got the rather daunting task of pushing the determined defenders out of their way. In order to make the unscripted exercise even more realistic most of the participating combat forces were equipped with battlefield simulators that allowed the exercising forces to simulate both direct and indirect fire against each other. I had the opportunity to briefly interview the Lt Col. Paul Maynard who commands the 40 Commando that formed the British contingent in the exercise. 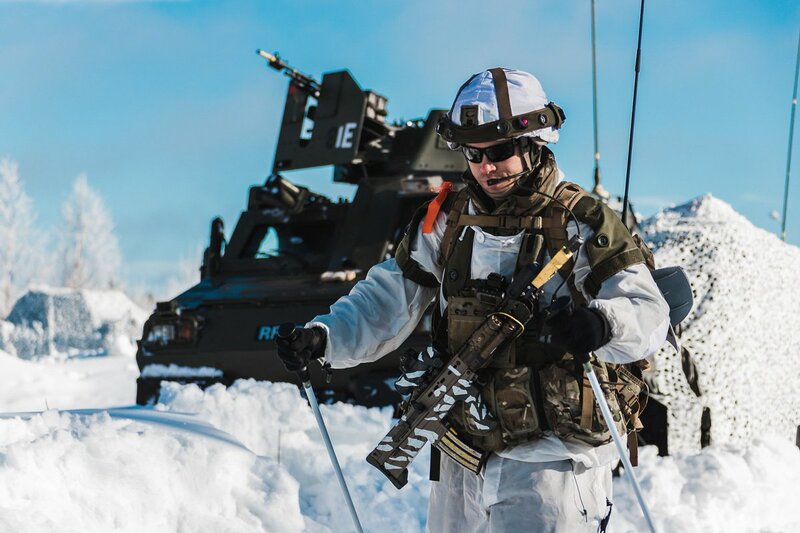 For the very first time the 350 British Commandos were fully integrated into the Norwegian brigade. It was also “Unprecedented” that the two reconnaissance troops participating in the exercise were commanded by a Norwegian brigade staff and provided timely information to the brigade commander. The logistics component of the Commandos was even more tightly integrated to the Norwegian logistics support battalion. British medics were embedded into Norwegian ambulance teams and mechanics attached to the battalion’s maintenance squads. According to the Lt Col Maynard the integrated brigade operated successfully with only some minor difficulties with the communications and sharing of the battlespace. He stated that the greatest success was the deployment of the Royal Marine contingent from their base in Norway hundreds of kilometers into the Swedish wilderness on time and without any problems. 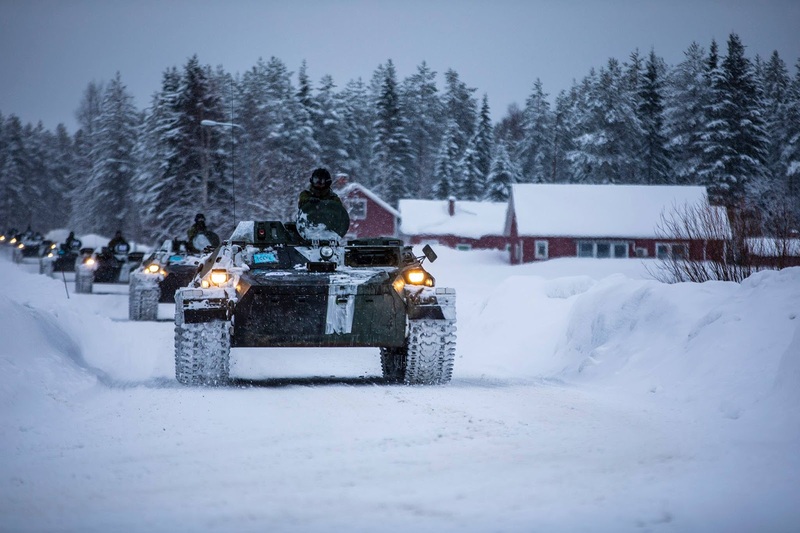 While the weather conditions in the Swedish north were challenging with rising temperatures softening the over a meter-deep snow in the forests, the Commandos were able to keep mobile as all of the participating soldiers were classified as ski-mobile. With the help of Viking armored ATVs, loaned Norwegian snowmobiles and some unarmored BV-206s they were capable of moving in pace with the attacking brigade. While the conditions in the high north are naturally challenging, the modern British equipment allowed the troops to maintain their fighting ability even in the sub-zero temperatures. In addition to the standard issue equipment the Commandos were testing some new pieces of equipment. Lt Col Maynard particularly mentioned that the new weapon-sights, that combined image intensifiers and thermal imaging sights into a single compact and lightweight optical sight, were very useful in the forests of Northern Sweden. While Lt Col Maynard very politely declined to comment on the success of the two brigades fighting against each other, he did bring out the fact that fighting against the combined Swedish/Finnish brigade was a challenge and the defenders had an upper hand as they were able to fight in familiar terrain dominated by natural choke-points. Also, the armor- and artillery-heavy composition of the defenders acted in their favor. He also estimated that the Swedish army was rather inexperienced in this kind of an unscripted force on force exercise, so they had a learning curve to overcome. While the 40 Commando will soon head home, the new arctic strategy of the UK will see British units of up to 2000 soldiers participating in future drills in the high north, stated Lt Col Maynard at the end of the interview. 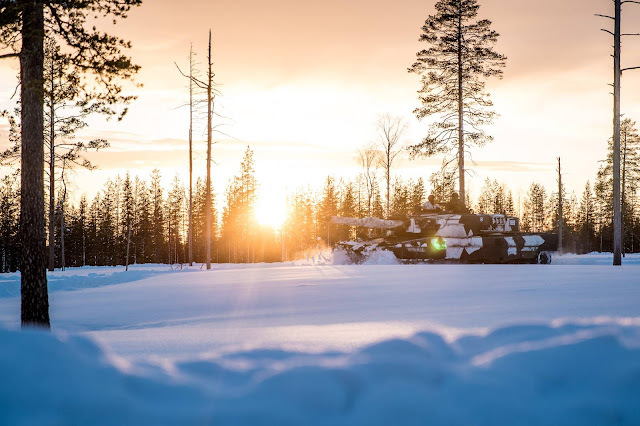 From a Finnish viewpoint the exercise has been a huge milestone for the Finnish-Swedish co-operation of land forces. The capability to field combined brigade-level formations is a crucial one, if there is ever a need to delay and to especially counter attack a Russian invasion across the Lapland. It’s equally important that Finland, Sweden and Norway and their closest partners, the UK and USA, ,are capable of staging a multi brigade exercise, without NATO participation. While both Finland and Sweden are non-aligned countries, they have forged close one-on-one ties with USA and the UK. As the NATO membership is not a short term solution for either Finland or Sweden, this bilateral co-operation demonstrates that they are capable of both receiving and giving military assistance to each other and partners from overseas.